I took this picture near The Dalles, Oregon. Can you see the oval etched against the skies? It is perfectly face-shaped. This striking oval is an unusual formation to discover in the branches of a tree. Last August this oak tree was scorched by the flames of a forest fire, yet it lives. There is new growth beneath the painful burning. It is a beautiful reminder of hope in the midst of hardship.This photo brings to mind one of the beautiful Psalms of David. And its leaf does not wither." I have posted this before, I think. 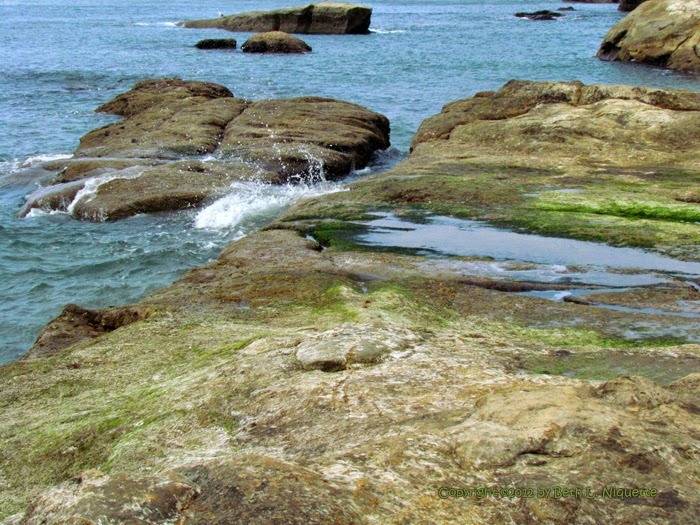 I have had a longing for the sea--and I know my darling Sissy has also felt this. Hence, I am posting this sunset heart over the sea for YOU, dear Sis. I caught these astonishing clouds with straight lines recently over the top of my house. These kinds of clouds always fill me with a bit of awe. Clouds aren't supposed to be square-shaped! The beauty of the skies bring to mind the Words the Maker of Life spoke to His servant Job. And say to you, 'here we are'?" And the clods hold together? I was stunned by the sheer beauty of the clouds last week. This is just a sample. In fact, the glorylight beneath the clouds is in the shape of a heart. Sweet sissy Clytie loves the ocean--so this one is for you, Honey! Can you see the rock heart behind the surf's spray? It took me a minute--but it is there. And his hands formed the dry land." Have a lovely day and Happy Guest Heart Thursday! My Husband and I went to a on Tuesday. We stepped out of the van, and were greeted by the brightly marked bird you see above. She was fanning her feathers and making a terrible fuss. She acted like she'd broken her wing. Then I realized we must be close to her nest. Indeed we were. We put up cones so no one else would bother this brave little mama bird. There were a lot of people, and we thought for sure someone would make the same mistake we did. When the conference was over, we removed the cones. What a dear little killdeer! Of course I found a heart nearby--can you find it? 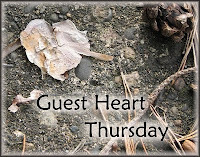 Have a lovely day and Happy Guest Heart Thursday!